I’ve really been trying hard to minimize grains from my diet. It’s not for any health reason, but it’s something that I try to do because I’ve found that I feel a lot better when I do. I don’t have as many cravings, which makes sticking to my points and making healthy choices MUCH easier. I also just feel better. And, that’s not even to mention the fact that when I minimize the grains, I’m left with meats and veggies – which means I get to eat more for the same amount of Points!! It’s a win-win! But there are times when you just want to eat something that isn’t good for you. We went out for dinner at our local Chinese restaurant recently. My daughter had a fried egg roll, and let me tell you, I REALLY wanted one too! I was salivating just watching her eat it. The oil, calories and fat weren’t going to be a good combination, however, so I thought that I would head back to the kitchen and try something that was just as good, but so much healthier. Of course, the first thing that I thought of was a stir fry. I thought that it would be perfect for this kind of a dish. You can have all the flavors of the egg roll and even prepare them in a traditionally Asian way. Just without as much oil, calories or fat! Turns out that this was a totally doable feat. In fact, it was super delicious. I used ground pork in mine, but you could use ground beef or ground chicken instead. Keep in mind that pork and chicken are both lighter flavors and will blend in with the classic egg roll flavors. Ground beef is a little bit stronger and will produce a different flavor. With my base of lean ground pork, I set about adding the classic egg roll flavors. I used a head of cabbage that I shredded, but you could easily just use a bag of shredded cabbage. I love the bagged shredded cabbage from Trader Joe’s. It’s organic and makes prep and clean up easy. The rest of the flavors of the egg roll were easy to add in. Onion, carrots, garlic and ginger are all part of the egg roll. I sautéed everything in a little olive oil and seasoned it with soy sauce (make sure it’s reduced sodium), sesame oil and rice vinegar. I added a little black pepper for a little kick. I love this Egg Roll Stir fry. It’s got all the classic flavor of an egg roll, but without the wrapper. This means it’s low carb, gluten free and far lower in Points than the traditional egg rolls. But you don’t sacrifice any of the flavor. This stir fry is ready in less than 30 minutes, which makes it perfect for a busy night when you’re craving take out but need something healthier. Now, I just have to come up with a light and healthy sweet and sour sauce to drizzle over it, then I’ll be in heaven! This easy stir-fry recipe has all the flavor of an egg roll, but without the wrapper. Low carb, gluten free, and a lot less fat and calories than traditional egg rolls - and so delicious! Heat 1 tsp olive oil in a large skillet over medium high heat. Add in onions and ground pork, and cook until meat is cooked through. Transfer to a bowl and set aside. Return skillet to heat, and add remaining tsp olive oil. Stir in cabbage and carrots, and cook, stirring regularly, until cabbage is softened and wilted a bit, about 5-7 minutes. In a small bowl, combine sesame oil, rice vinegar, soy sauce, garlic, ginger, and pepper. Reduce heat to medium. 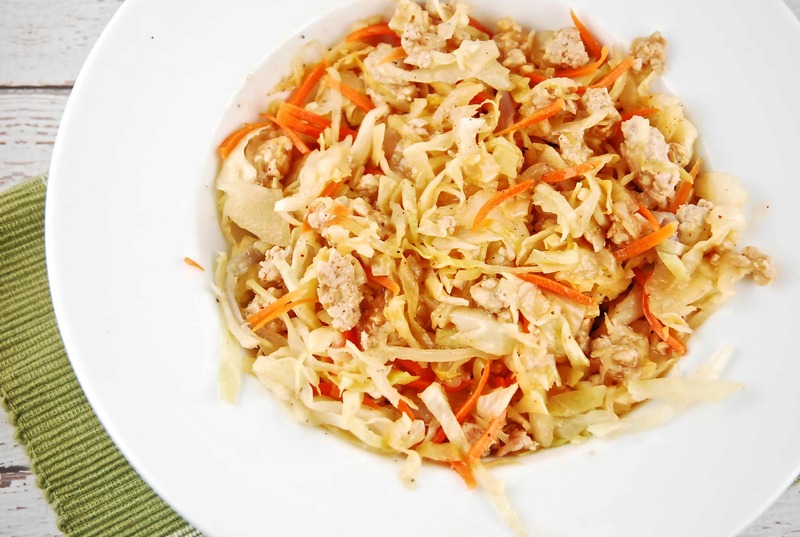 Return meat to the pan with the cabbage, and stir in the soy sauce mixture. Stir well to combine. Cook for another 2-3 minutes, and then serve. Gosh Im confused about the difference of ground turkey or Chicken. I first thought turkey would be less fattening choice but Ive seen that chicken is way lower in calories. Now that ground chicken is offered more….should I be buying that? Help clear up confusion. Did you know that WalMart carries a WW friendly eggroll? They are made by Van’s and are in the Deli section of the store. OMG they are amazing. 1 chicken eggroll = 4 SP and 2 = 7 SP. I baked them in my toaster oven and made a dipping sauce for 0 SP. I used 1 T Smuckers SF Orange Marmalade and added soy sauce and Sriracha to taste. AMAZING!! Am I missing the pinterest button? Have you thought about stuffing this into a wonton wrapper and baking it in the oven with a little chili sauce for dipping? It is a starch, but still an eggroll (kind of) Either way, I love your recipes. They’ve helped me lose about 13 pounds (& counting) and there has not been one recipe that Ive tried that I haven’t loved. And I do at least two a week. Thanks again!